As we all tuck into turkey, mashed potatoes, and delicious desserts this Thanksgiving, it’s important to remember not to overdo it. You might be surprised how many calories are lurking in your grandma’s stuffing or that last slice of pecan pie. In fact, the Calorie Control Council says that on Thanksgiving, many American will consume 3,000 calories for dinner and 1,500 in snacks and drinks — that’s a whopping 4,500 calories in a single day, 45% of which is from fat, according to the council. 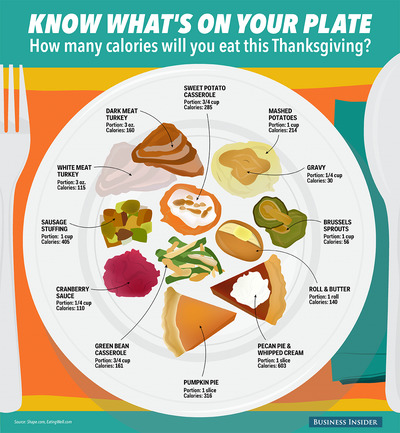 See how many calories are in your favourite Thanksgiving dishes.